Europe’s Tribute to Elvis® festival & Championship will brings Elvis Fans from far and wide to the perfect holiday spot – Blackpool to celebrate the KING OF ROCK AND ROLL - ELVIS PRESLEY! With some of the worlds greatest tribute artists gracing our stage that is set in The Royal Suite at The Blackpool Hilton. Our Ultimate Elvis contest preliminary heat is sanctioned by Graceland. We have special guests, Elvis entertainment , raffles vendors , aftershow parties . And we have the Ultimate Elvis Peliminary heat in where our winner will represent us in the finals in Memphis . This is a wonderful weekend of remembering ELVIS through his music .We invite you to join us on our first annual Tribute to Elvis Festival® - where the spirit of Elvis is guaranteed to rock this summer holiday town. We've created a world class event respectful to everything that Elvis® stood for. We picked Blackpool because of its location, less than 15 minutes from an airport and easily accessible via car , train or airplane and the Hilton as it is synonymous with Elvis . The one and only seaside town to celebrate the greatest entertainer of all time Elvis Presley . Follow that dream and join us. 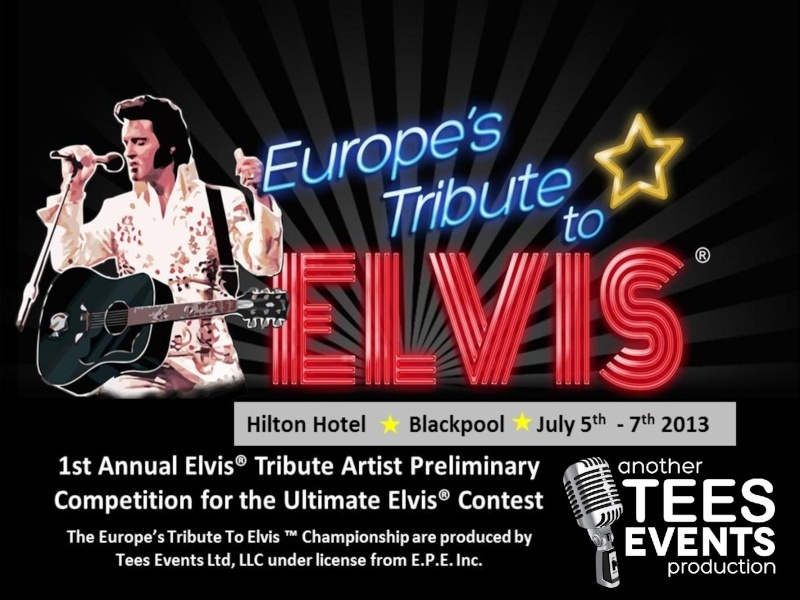 Presented by Tees Events Ltd.
Our first Annual Europe's Tribute to Elvis® festival & Championship will brings Elvis Fans from far and wide to the perfect holiday spot Blackpool to celebrate the KING OF ROCK AND ROLL - ELVIS PRESLEY! With some of the worlds greatest tribute artists gracing our stage that is set in The Royal Suite at The Blackpool Hilton. Our Ultimate Elvis contest preliminary heat is sanctioned by Graceland. We have special guests, Elvis entertainment , raffles vendors showcases, after show parties. 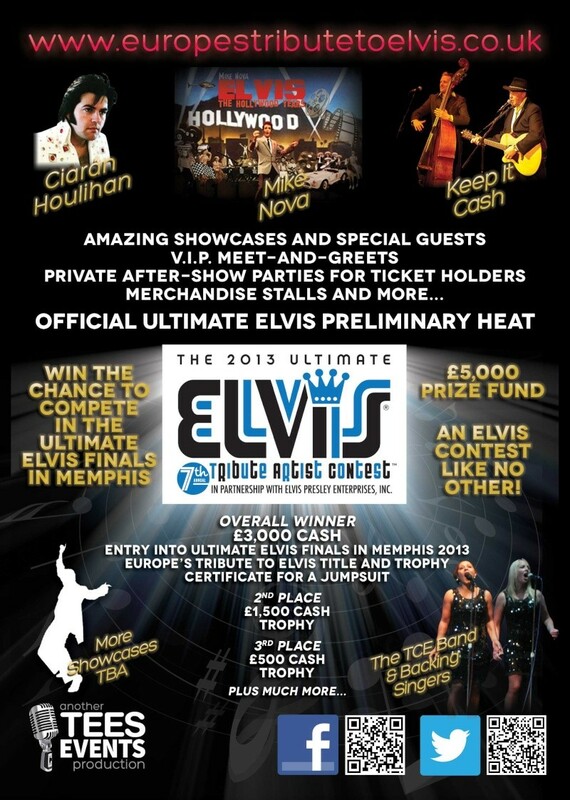 Also we have the Ultimate Elvis Preliminary heat in which our winner will represent us in the finals in Memphis in August 2013.Our special guests include Charles Stone , Marlyn Mason & Dan Haggerty.This is a wonderful weekend of remembering ELVIS through his music. We invite you to join us on our first Annual Tribute to Elvis Festival - where the spirit of Elvis is guaranteed to rock this summer holiday town in a way that Blackpool has never experienced before.We've created a world class event respectful to everything that Elvis® stood for. We picked Blackpool because of its location , less than 15 minutes from an airport and easily accessible via car , train or airplane. Tickets on Sale now ....Further showcases to be Confirmed.